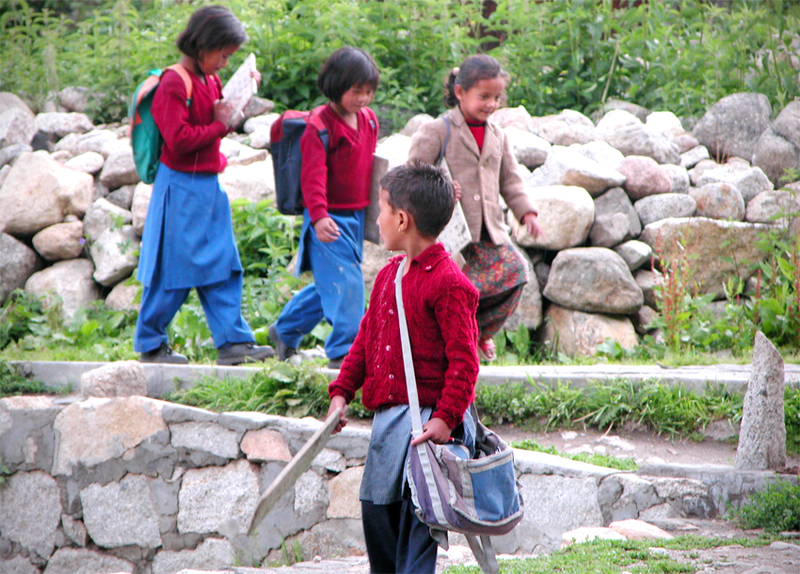 Kids coming home from school, carrying their slates, which are still used up in these parts. On the right you can see a ‘Debta’ post – very strong magic. 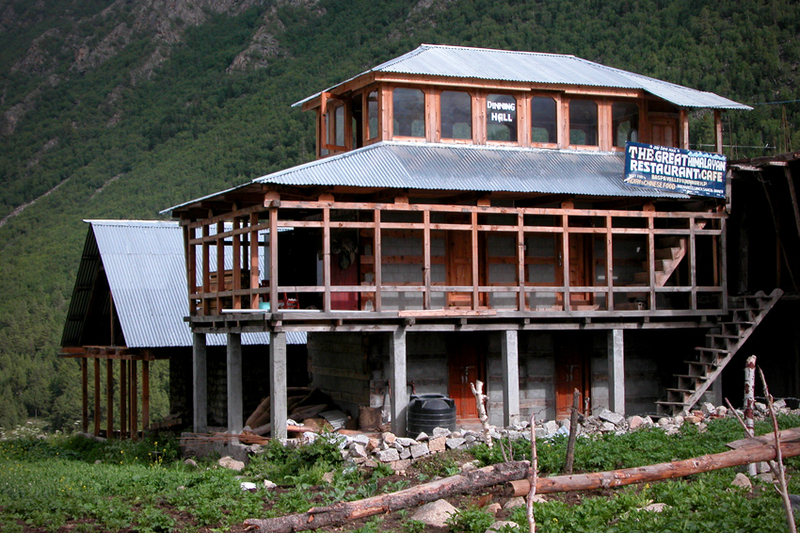 Chitkul. Something we came across here in Chitkul was the occasional “Debta” (sp) stones. There was often a patch nearby where a fire had obviously been going. These stones are two or three feet high, stand alone and are not to be touched. A local guy we chatted with (who’d been university educated) told us that when he was a kid and hadn’t learned about this taboo yet, he touched one of them and his skin erupted with horrible sores. So we made very sure to keep an eye out for them and not bang into any accidentally. Okay, it may not be part of our belief system, but we had no problem respecting the locals’ beliefs and customs. After a wonderful day strolling around the village, we found out that the new restaurant that was being built (‘The Great Himalayan Restaurant’) and wasn’t open yet, was actually open if you could find the chef ‘Bobby’ and sweet-talk him into cooking for you. He just wasn’t into crowds so he hid a lot. So I sat at the only other dhaba available (‘The Great Hindustani Dhaba’) while my partner went to use his charms on Bobby. 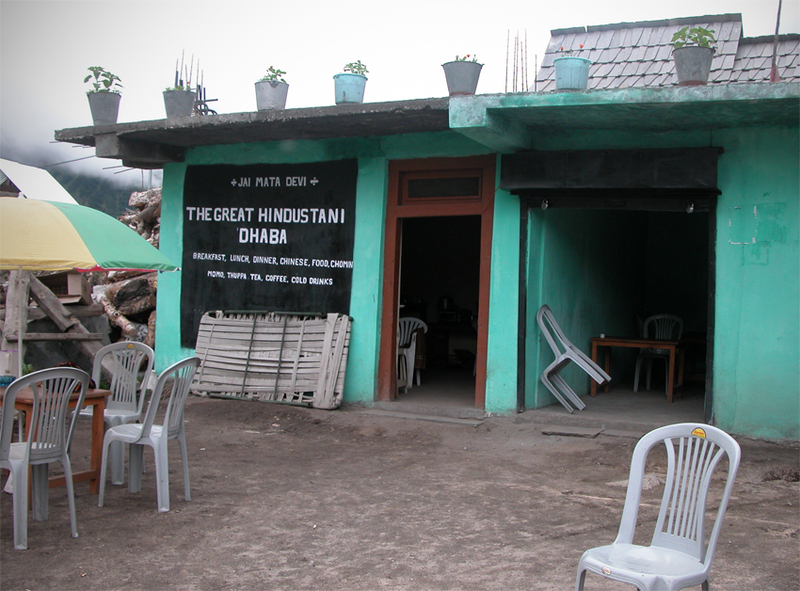 The Great Hindustani Dhaba advertised on a large sign outside the door the following: ‘Breakfast, Lunch, Dinner, Chinese, Food, Chomin, Momo, Thuppa, Tea, Coffee, Cold drinks’. I grinned as various silly thoughts went through my head. How did they cook their Chinese? Did they have to chase them down first? In which case, were they tough to eat? Were they willing to serve them with Chomin, or were they a stand-alone dish? I have no idea what a ‘thuppa’ is, but when we first got here we were delighted to see we could get Momo (Tibetan dumplings, a favourite of mine) at this dhaba. Except we couldn’t. Because the man who made the Momo had gone elsewhere (no further explanation). Upon enquiring about the ‘Chinese’ and ‘Chomin’ (Chow Mein), it turned out the afore-mentioned absent guy was also the cook of these things. The only thing the remaining guy could cook us in the late afternoon BEFORE dinnertime (at which time he apparently shuts the door) was a packet of Maggi 2-Minute Noodles each. And these took about thirty minutes to get to us from the time of asking. We were starting to catch on that all was not as meets the eye in this ONE AND ONLY daily eating establishment. So I sat and sipped my chai (which this guy was able to brew with reasonable competance) and crossed fingers that Bobby and my partner got on well together. As it turned out, they did, and my partner came back with a 7.30pm dinner appointment for us. So a little later we left our room and went back down to the restaurant, and imagine our surprise when we found it half full of very loud-talking tourists who’s country of origin I will not mention here. The secret was out! So much for our quiet little tete-a-tete over candlelight with gentle music in the background. However, the food was varied and fabulous, and even if we couldn’t hear it over the talking, there was gentle music playing in the background. Comfort, which always goes down so well in the mountain air, and danced under the stars to Santana with an audience of bats and a firefly or two. The next day a few of the local women turned up, and after a few minutes of confusion it became clear that they wanted to see the little movie of my partner’s daughters (7 and 3 yrs) dancing back at home. They were absolutely delighted at this miracle of technology and the cuteness of the girls. We were to see these women go by every day after that and they always waved cheerfully or stopped for a quick chat. The local ladies marvelling at the technology we bought with us (digital camera) and getting all gaga over the cute little girls on the video. After breakfast and chai, I did some of my washing before it came crawling out of my backpack of it’s own volition. Mountain water is cold! My hands became so numb I had to take time out to warm them up again before wringing my clothes. We also acquired a couple of the local-style coats, tailor-made with goats wool (I think). This was most fortuitous, as there is no market here, no shops selling garments and when we enquired, we found that all the tailors in the village were too busy to take on any more work. I won’t say who or where we got these coats from, because as the days went by we noticed that we were the only foreigners wearing them, so we gathered it was just a quiet little transaction with a person who had somewhere along the line come to the conclusion that he’d feel okay about trading with us. This trade transpired while no one else was around and nothing more was mentioned, although we saw one or two double-takes by some of the locals, and the odd little grin in the corner of the mouth of the guy we got them from. These jackets are worth their weight in gold. They are extremely warm and very windproof, and we had no problem with the cold once we donned them. Apart from bedtime, they were to stay on us for the rest of our stay in the village. 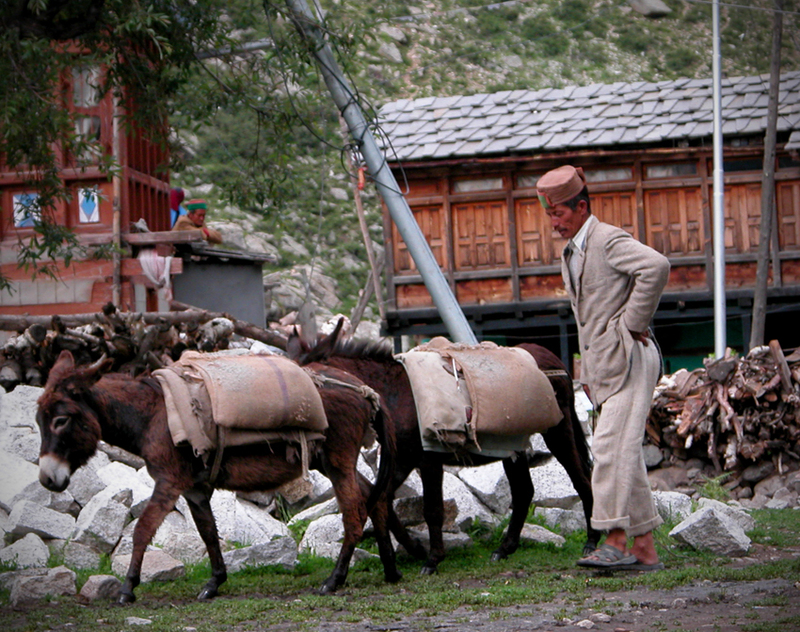 Donkey power and legs – the only form of transport in the village. 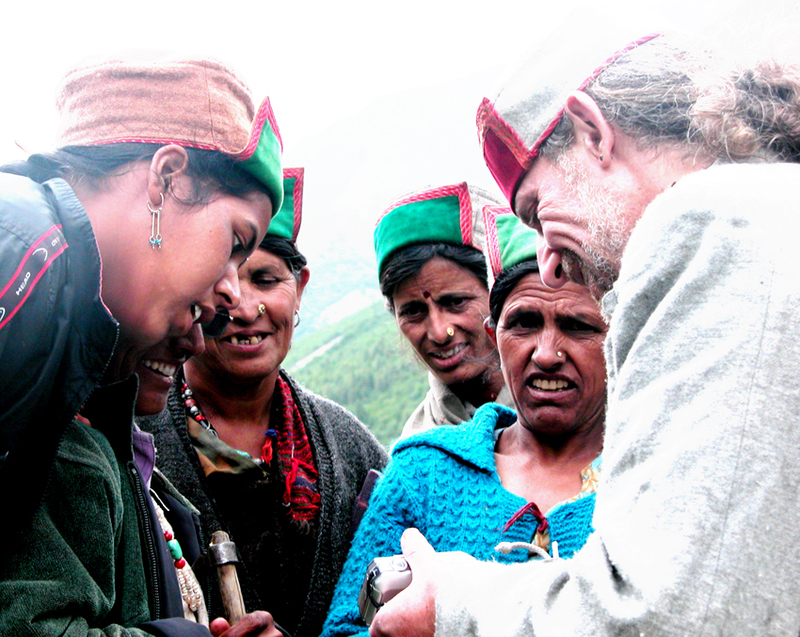 This villager wears one of the beautifully-cut jackets favoured by the locals. Again, we wandered around this beautiful place, looking and marvelling. 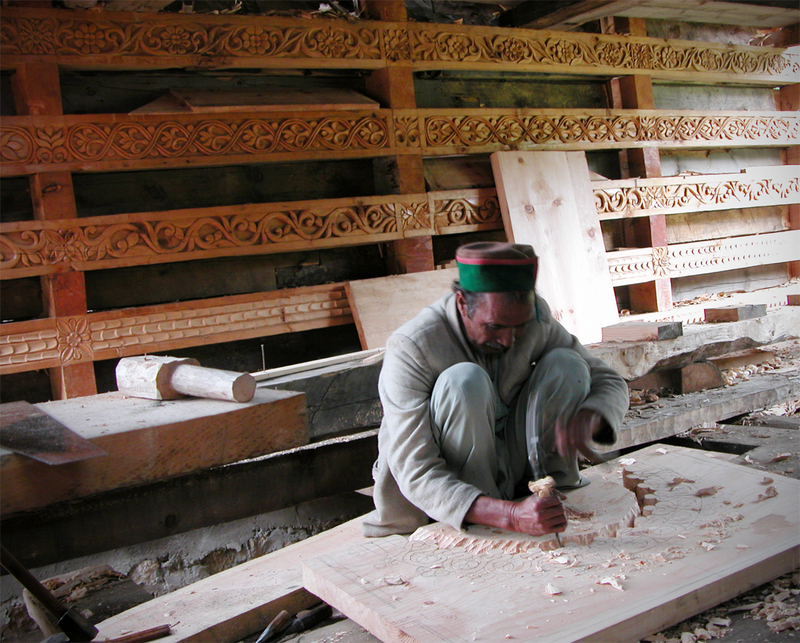 We stopped and talked with four carvers who were working under a tarpaulin, on the new Debi temple in the temple square. They were very nice guys and their work is exquisite. Apparently they’ve been hired by the ‘Archeological Foundation’ or some such outfit, and they are given lodging, food, local brew and 250 rupees a day. This is a brilliant wage as far as India goes. No wonder they’re so content – they get to be creative and are paid very well for it. Wonderful. 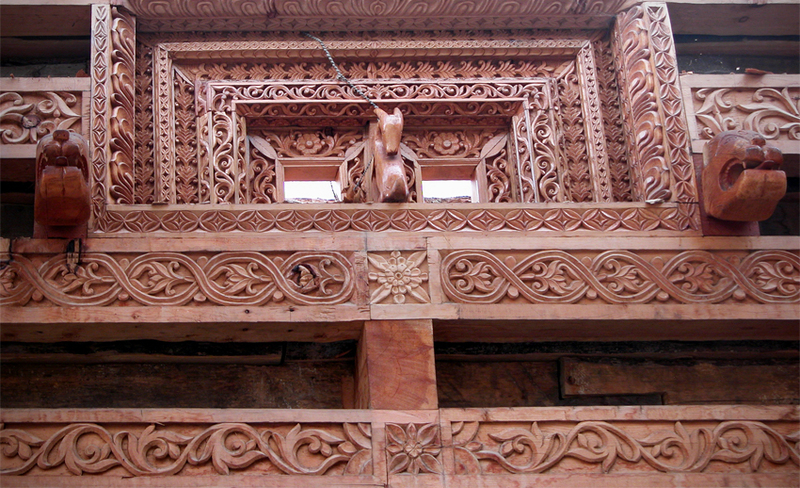 Carver at the Devi Temple construction site. This entry was posted in Ravings - random wafflings, Ravings on India 2007, Travel and tagged archeological, carving, Chitkul, Eating, Himalayas, India, Mountain, temple. Bookmark the permalink.